AJ is a 2011 graduate of Monticello High School. During his time at Monticello, he was selected to 3 All-Conference teams, 2 All-Region teams, and was named 1st Team All-State twice – once as a First Baseman and once as a Pitcher. At the conclusion of his Senior season, he was selected by the State committee to participate in the annual Iowa High School Baseball All-Star Series as a member of the Small Schools East team. AJ continued his baseball career at the collegiate level at Coe College from 2011 to 2015. During his time at Coe, AJ was a 3-time, First Team All-Iowa Conference Selection and a 3-time, All-Central Region Selection at 3 different positions (First Base, Utility, Pitcher). He also competed in 2 NCAA Regional Tournaments with Coe, and was selected to the 2015 All-Midwest Regional Tournament team his Senior year. 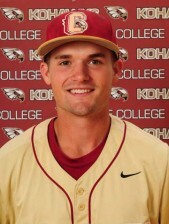 AJ has rejoined the Coe Baseball program as the Assistant Baseball Coach/Recruiting Coordinator. Lesson Rates: $25 for 30 minutes. $40 for 60 minutes.